Yes, climate change is creating conditions for the extraordinary wildfires near Fort McMurray, Alberta, but El Niño played a bigger role, says atmospheric scientist. In the wake of the damaging Alberta fires, there has been a lot of attention paid to what role climate change plays in wildfires. Yet 2016 is also a powerful El Niño year, which has created ideal conditions for the extraordinary fires in Alberta. So what climate phenomena could have led to the persistent warm, dry conditions and the extreme fire events? I have analyzed weather trend data and found that higher temperatures and lower precipitation created the conditions for the extensive fires. It is by looking at exactly when those warmer months occur that we can begin to sort out the role of El Niño versus climate change. May is frequently an active fire period in Alberta because dead and dormant plants tend to dry rapidly after the spring snowmelt. Yet, this year has stood out from other years with more extreme conditions, according to media reports. Wildfires depend on sufficient dry fuel, so weather conditions strongly impact fire potential. Snow cover and rain suppress fire. Low humidity and high temperatures favor fire. In western Alberta, if the wind blows from the west, it forces air to descend to the plains from the mountains, leading to dry and warm conditions. Wind from the east flows up slope, generally leading to cool moist conditions. 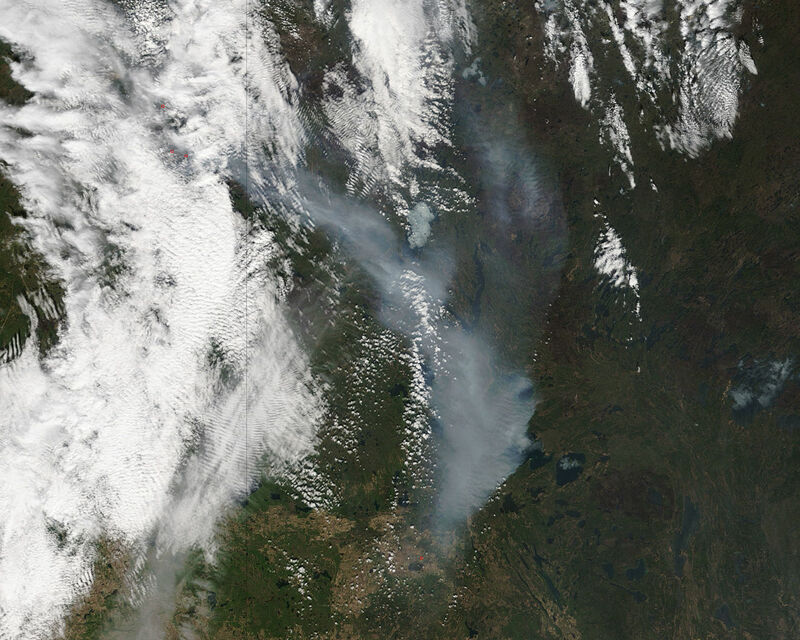 In spring 2016, prime conditions for fire were met. January through April precipitation was roughly 20 percent of normal, leading to low snow pack that melted early and dry fuels. Further, a high pressure ridge – an elongated region of high pressure – favored enhanced down slope flow and warm conditions in April and early May. To understand the climatic factors at play in creating these conditions, I studied historical weather patterns in the region over the past decades (see chart). What I found is that there is little evidence of changes in the month of April over those years since 1950. April is an important month because it sets the stage for fires in May. An absence of a warming and drying trend during April suggests little direct contribution from climate change to this fire event. I thus urge caution in attributing these particular fires to climate change. In contrast, a similar analysis applied to the periods from January through March and from June through July shows substantial warming and drying over the years. This warmer weather during other times of the year, especially June through August, does suggest that climate change is impacting fire seasons overall. For example, some authors have suggested that the average area burned each year in the region has doubled, and such changes might be associated with climate change when considered over the entire fire season. April was warmer and drier than normal this year. But because April has seen little warming and drying over the decades, I believe that El Nino had a larger role in this year’s May fires than climate change. Indeed, an unusually strong El Niño can explain the events that occurred this year. El Niño is an occasional warming of the sea surface in the eastern equatorial Pacific Ocean that leads to more rainfall over the warmer water. The enhanced rainfall in the tropics heats the atmosphere, causing air to spread from the equator toward the north and south, which, along with the rotation of the Earth, generates a pattern known as a stationary Rossby wave that extends across the north Pacific and North America. This atmospheric wave leads to profound changes from the normal weather patterns there. Every El Niño event generates the warm water and associated tropical rainfall differently, and the position of the warm water can change over the lifetime of El Niño events. Different El Niño patterns result in the Rossby wave taking on different positions. For example, warmth over the equatorial central Pacific Ocean often results in a high pressure ridge near the west coast of North America, while warmth shifted farther east can result in a ridge tending to occur over eastern Canada. 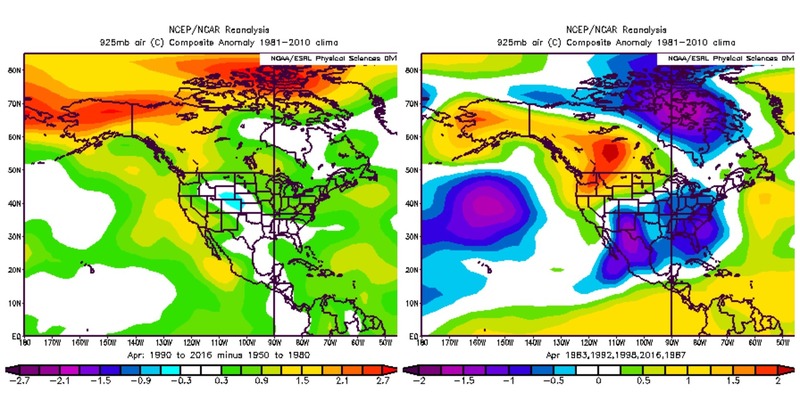 By tracking the structure of the historical El Niño rainfall patterns, I found a circulation pattern over North America broadly similar to the average pattern from March into early May 2016. This pattern, which features a strong warm ridge over Alberta, would have reduced the winter snow pack and resulted in dry warm conditions during April and May. This year’s El Niño event, in particular, spent most of its lifetime in between the central and east Pacific El Niño extremes, favoring a ridge over the Canadian Rockies and Alberta: an ideal scenario for a low snow pack and warm dry conditions in the spring. The conclusion: climate change is unlikely to explain the specific timing of this event in April to May, instead natural variability associated with an extreme El Niño event likely enhanced the dry warm conditions that generated the extreme fire we’ve seen in central Canada. As for the traditional summer fire season, trends associated with climate change have already proven to be important. The present El Niño state is gradually reversing, but its effects may linger into this coming summer season when climate change effects may be more important. Paul Roundy, Associate Professor of Atmospheric and Environmental Sciences, University at Albany, State University of New York. This article was originally published on The Conversation. Read the original article.